There are 3 types of people in this world (at least among the inhabitants of the kitchen): the cooks, the bakers, and the bread bakers. The cooks are the improv guys. They have a hard time with exact measurements and “follow” recipes only in the loosest sense of the term. The bakers are the chemists. They mix a bunch of stuff together (measuring all the ingredients carefully according to the recipe), put it in the oven, and wait for some magic to happen. Their idea of improvisation is adding cranberries to their oatmeal cookies instead of raisins. And then there are bread bakers. Not the bread machine guys. I mean the serious bread bakers who obsess about a perfect baguette or ciabatta. They are the biologists, in my mind. They are dealing with a living creature – growing, changing, and completely unpredictable. Making a good loaf of bread is like raising a child (only faster and without as much gray hair). It takes the precision of a chemist with the intuitive understanding of a cook. As you, no doubt, have guessed by now – I am a cook. I like understanding my ingredients and improvising to bring out the best in them. For instance, I believe that fish have personalities (delicate, fleshy, assertive, etc), as do the veggies (starchy, crunchy, green, leafy, etc). I know how they work, and I am perfectly confident even when I come across one that I haven’t tried before. The chemistry type baking is not my thing. I love making tarts (mostly because I get to mess with the filling) and couple of other things, but overall I don’t get much satisfaction out of the process. No matter how well it comes out, I don’t really feel like it’s my creation. All I did was follow the instructions. But watching Jason’s bread baking journey got me intrigued. First you have to measure everything perfectly, but then you might have to add more flour based on how the dough feels. You might have it rise longer or shorter depending on the room temperature and the whims of the bread gods. Although you start with a recipe, you have to actually understand how ingredients react to each other to make it work. It’s really not my comfort zone, but about a year ago, I set out on a quest to master pirozhki (Russian stuffed buns), which require a brioche type dough. After a few tries they were actually good. This gave me the idea to attempt a panettone this weekend to bring to our friend’s house for Easter. 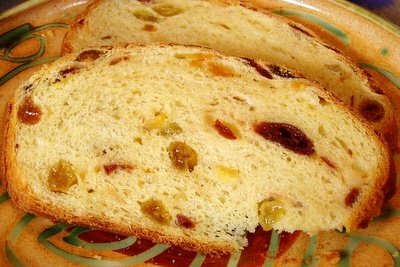 Panettone is an Italian holiday bread like a brioche, but packed with dried or candied fruit. No filling or other embelishments for me to lean on. The dough has to be good on its own. Since I had the most luck with Julia Child’s brioche in the past, I decided to try her leaner version that called for only 1 stick of butter per pound of flour instead of a recipe with 3 sticks that I tried from her book in the past. But since Mastering the Art of French Cooking, Volume 2 didn’t give instructions for using a mixer, I took that part from Baking with Julia book. I also added raisins, dried cherries, candied orange and lemon peel (all soaked in whisky). Since I wanted to end up with a round panettone shape, I followed Reinhart’s instructions for shaping and baking from The Bread Baker's Apprentice . All that, plus lots of supervision from Jason. I made little rolls in the muffin cups and also a large round loaf. The little rolls were done first and I couldn’t help breaking into one. After all this work, it was a complete disappointment – the crust was too hard and the inside was dry. I was ready to blame the dough – did I knead too much or not enough? Did I add too much flour? But Jason had a feeling that I might have over-baked them. He stuck an instant read thermometer into the large loaf and it reached 185F (the done temp) in only 50 minutes rather than 1 1/2 hours the recipe suggested. So 25 minutes for the little rolls must have been way too long. I didn’t expect the shorter baking time to solve all my problems, but I was hoping it would at least help some. I was eyeing the loaf suspiciously when it came out of the oven. We couldn’t cut it since we were bringing it to our friends' house, and I couldn’t help wishing there was an X-ray machine for breads. When we finally got to taste the larger loaf, it was fantastic (to my great surprise) -- buttery crust with perfect silky crumb. The whole thing was gone in 10 minutes after we cut it. When only 2 pieces were left, I finally remembered to take a picture. You can always stop the rise by putting the dough in the fridge and restart it again by pulling it out. This allowed me to spread the process over 2 days to make it more convenient. Don’t expect the dough to stop rising as soon as it goes into the fridge. It will take a few hours for it to cool down. Shaping brioche is much easier when the dough it chilled. Don’t rely on the recipe to tell you how long to bake. Use a thermometer. When in doubt, ask Jason – he is always right. Even if something goes wrong, you can always let your brioche go stale and make bread pudding. I laughed when read your opening - I'm the classic improv guy, comfortable in the kitchen but won't actually follow a recipe to save my life. A recipe is a guide, not an edict, right? I'm finding this doesn't work so much for the baking, but it is fun trying. Thanks for the tips. Beautiful post, Helen! And the panettone is great ... although I'm not sure which type of the three I am! I am with you on baking, Jared. I find that improvising with doughs and batters is a recipe for disaster. Ivonne, maybe you are really good at all three! Some people are :) But I thought everyone enjoyed one just slightly more than the other. Which cooking activity describes you more? 1) Have a dish in a restaurant and try to reverse engineer it without considering to actually look up a recipe. 2) Trying different recipes in search for the best cookies, risotto, roasted chickent, etc. Of course you might do both, but is one more pronounced than the other?